NEW YORK, NY.- Anders Wahlstedt Fine Art presents Chris Macdonald: Recent Sculpture, the artist’s first solo exhibition with the gallery. Macdonald’s newest body of work consists of a multitude of small scale sculptures, painted with enamel and created from galvanized metal. Each new work is displayed on a 4ft x 7ft wooden table which allows for a multitude of relationships, categorizations and conversations to emerge within and between each individual sculpture. In his latest exhibition Macdonald’s dense, wooden sculptures of the past are replaced with a lighter more whimsical medium. Notions of play and technology reminiscent of previous works continue to be explored but with a more refined execution. Abstraction and representation are blurred allowing for multiple narratives to emerge. 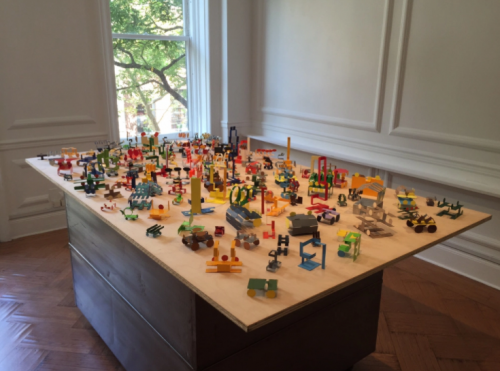 Each piece can allude to machinery, toys, architecture and contemporary sculpture simultaneously. There is a strong relationship evident in these works to Calder’s painted mobiles, often viewed as drawings in space. Unsurprisingly, Macdonald’s recent sculptures begin with a drawing on a square sheet of thin metal. The paper like surface lends itself to this two dimensional art form, which through the process of reduction is molded into a three dimensional object. However, unlike Calder’s mobiles, that gently move in space, Macdonald’s miniature pieces remain static, implying movement through a continued investigation into mass, scale, line and color. The result is a sense of delicacy and weightiness. Tense abstractions ready to burst from their immobility at any moment. Chris Macdonald was born in Lynn, Massachusetts in 1957. He studied at Worcester Art Museum School in Worcester, MA. He currently lives and works in New York City. Macdonald has exhibited extensively in this country and in Europe since 1984. One person exhibitions have included those at Cable Gallery, New York, NY 1984, Diane Brown Gallery, New York, Ny 1986, Wilhelm Lehmbruck Museum, Duisburg, Germany 1987, Wurttenbergischer Kunstverein, Stuttgart, Germany 1987, David Beitzel Gallery, New York, NY 1988, Vaughan & Vaughan, Minneapolis, MN 1989, David Beitzel Gallery, New York, NY 1989, Baron/Boisante, New York, NY 1991, David Beitzel Gallery, New York, NY 1992, Wasserman Gallery, Munich, Germany 1992, Baron/Boisante, New York, NY 1993, Baron/Boisante, New York, NY 1994, Kemper Museum of contemporary art & design 1994 and Hirschl & Adler Modern 1999. Chris Macdonald: Recent Sculpture is on view from September 14th to October 21st, 2016.